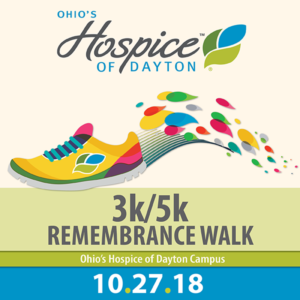 Family members and friends will gather to remember loved ones and walk to support Ohio’s Hospice of Dayton this weekend during the 14th annual Remembrance Walk. More than 1,000 people will walk in memory or in honor of a loved one. The route starts at the Hospice House campus at 324 Wilmington Avenue, winding through the neighborhood before returning to the campus. Participants can enjoy a shorter or longer route of their choosing. The course is wheelchair and stroller accessible. For the safety of all participants, no roller blades, bicycles, or unleashed pets are permitted. Parking is available off-site at various locations with shuttle buses. Food trucks will be availa ble on site. Event registration starts at 8:30 am on Saturday, October 27 and the walk begins at 10 am. Net proceeds benefit Ohio’s Hospice of Dayton patient care and services.